Houston-based BHP Billiton may soon get the green light to export condensate from the Eagle Ford Shale. According to the Houston Chronicle, BHP President Rod Skaufel confirmed the company has applied for an export permit with the U.S. Commerce Department (US DoC). In June 2014, Pioneer Natural Resources Co. and Enterprise Product Partners LP were granted permission by the US DoC in a private ruling to export minimally processed Eagle Ford condensate. In late July 2014, the first exports began. The US DoC's ruling in June 2014 was the first sign the United State's oil export ban, which has been in place for nearly 40-years, could be subject to change. Following the Arab oil embargo of the early 70s, in 1975, President Gerald Ford signed into law the Energy Policy and Conservation Act, which in effect bans most U.S. oil exports (refined products are not included in the ban). The minimally processed condensate currently being exported by Pioneer and Enterprise is considered a refined product by the US DoC. With the U.S. slated to become the top oil producing country in the world by 2015, according to the International Energy Agency (IEA), the necessity of the ban is puzzling to some, but still viable to others. In recent months, there's been a push from industry leaders for the federal government to relax and even lift the ban, including Continental Resources CEO Harold Hamm. Continental Resources is the second largest producer in the Bakken Shale in North Dakota, which also produces light oil and condensate. Due to its position in the play, among other factors, the company is in an attractive position for exporting condensate should it get the go-ahead from the US DoC. “Our position in the Eagle Ford is right in the heart of the condensate window, and the economics of the wells average a 70% rate of return,” said Skaufel, in an interview for Unconventional Oil & Gas Report. BHP plans to spend $3-billion of its $3.9 billion budget for onshore U.S. in the Eagle Ford in 2014. 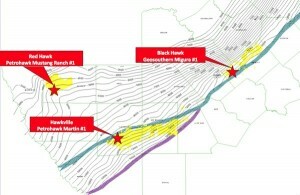 The company entered the Eagle Ford Shale in 2011, with the acquisition of Petrohawk for ~$12-billion.